Confederate brigadier general; president of Raleigh and Gaston Railroad, 1852-55; member of Congress, 1855-61. Home here, grave 2/3 mi. east. Lawrence O’Bryan Branch, railroad official, Congressman, and Confederate brigadier general, was born in 1820 in Enfield. Shortly after his birth, his parents, wealthy plantation owners, moved the family to Tennessee. Branch’s mother died in 1825 and, upon the death of his father two years later, he was returned to North Carolina and placed in the care of his uncle, U.S. Senator and former North Carolina Governor John Branch. When John Branch was appointed Secretary of the Navy by President Andrew Jackson, the younger Branch went with him to Washington. He then was sent to Bingham Academy followed by a brief stint at the University of North Carolina before he completed his college degree at Princeton University in 1838. 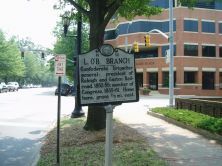 After college, Branch moved to Nashville, Tennessee, where he became a newspaper editor and began studying law. He then moved to Tallahassee, Florida, where he obtained his law license in 1840. During the Seminole War, Branch acted as an aide to Governor Robert R. Reid of Florida. In 1844, while visiting family in North Carolina he met and married Nancy Haywood Blount, the daughter of W. A. Blount of Washington, N.C. Four years passed before he settled his family and opened a law practice in Raleigh. Branch held a number of prominent positions in the decade prior to the Civil War. In 1852 he was appointed president of the Raleigh and Gaston Railroad and was chosen as an elector for the Democratic ticket of Franklin Pierce and William Rufus King. In 1854 he was elected to the U.S. House of Representatives, where he served from 1855 to 1861. President James Buchanan offered him an appointment as Secretary of the Treasury but Branch declined. When North Carolina seceded in 1861, Branch, a staunch Democrat, enlisted as a private in the Confederate army, but was soon appointed the state’s Quartermaster General by Governor John W. Ellis. Desirous of a field command, Branch obtained a commission as colonel of the 33rd North Carolina Infantry. On January 17, 1862, he was appointed a brigadier general. He commanded his brigade at the Battle of New Bern in March 1862, and again when the unit was ordered to Virginia. Branch led the command at the engagements of Hanover Court House, the Seven Days’ Battles, Second Manassas, and Sharpsburg. On September 17, 1862 at Sharpsburg, also known as the Battle of Antietam, Branch was shot and killed by a sharpshooter while maneuvering his brigade into line. 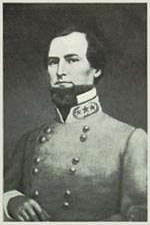 His commanding officer, General A. P. Hill, wrote of his death that, “The Confederacy has to mourn the loss of a gallant soldier and accomplished gentleman. 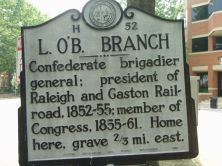 He was my senior brigadier, and one to whom I could have entrusted command of the division, with all confidence.” Branch’s body was returned to Raleigh, where he was buried in the Old City Cemetery.